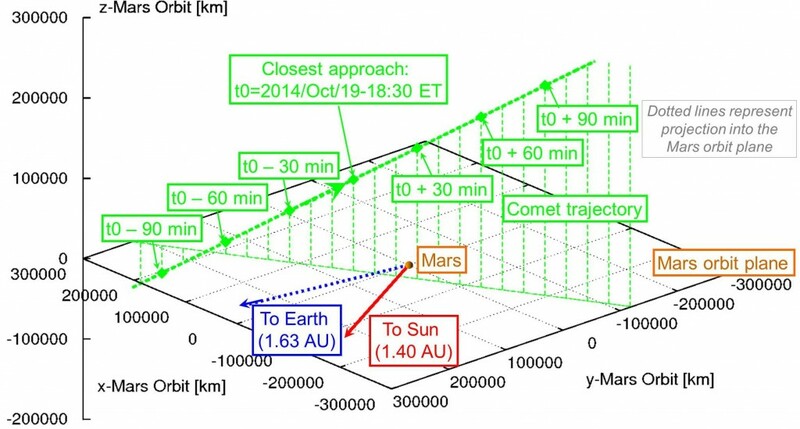 Today’s post continues where we started last week with an update from the Mars Express Flight Control Team at ESOC on their preparations for the 19 October Comet Siding Springs flyby. Today: defining the challenge! Before we look at Mars Express in more detail and decide what we can do to try and protect it from the speeding particles in the comet’s coma (the cloud of dust and gas surrounding the nucleus), we should take a moment to briefly describe the spacecraft and the encounter period. The shape and structure of spacecraft are normally described using a coordinate reference frame. For Mars Express, we on the team often use a more informal description where the high-gain antenna is referred to as the ‘front’, the thrusters are on the ‘bottom’ and the instruments face out from the ‘top’. As these directions are given from the Mars Express point of view, the MARSIS (Subsurface Sounding Radar / Altimeter) booms are therefore mounted on the right of the spacecraft. Further, the left and right side each have a solar array extending away from the main spacecraft body that can rotate through 360°. The spacecraft is, in principle, able to turn in any direction, however the left, right and rear sides have radiators for shedding heat from the platform and payload systems and should not be illuminated by the Sun. The top should also not be pointed toward the Sun as some of the instruments require cooling to operate effectively and optics may be damaged by direct sunlight. During scientific observations, the instruments are pointed toward a target to collect data, and – for communication – the antenna must point toward Earth. These two tasks, as you may have guessed, do not happen at the same time and science data is recorded and downlinked to Earth later. Also, for the majority of observations, the attitude of a science observation is in no way compatible with communications pointing. Finally, the solar arrays should be pointed towards the Sun whenever possible to generate electricity (although power can be stored in batteries for short periods). This image illustrates the relative orientations of Mars, the comet, Earth and the Sun on 19 October. The particles in the coma are ejected away from the comet with a speed of a few metres per second (m/second) but as the overall speed is so high we are treating them as arriving along a line parallel to the path of the comet. In other words, we are treating them as a stream of hyper-velocity particles washing past, over and around MEX. It is worth noting the relative direction of Earth and Sun; if we want to stay in touch with the spacecraft during the flyby, the antenna must point toward Earth. So, in summary, the direction in which we orientate the spacecraft and the solar arrays has a big impact on how Mars Express communicates with Earth, generates power, controls its temperature and conducts science observations. Now we have additional factors, as we have an interesting target passing by that our science teams really wish to observe as directly as possible – but with it comes a stream of potentially damaging particles! These particles might not only physically abrade the outer surface of the spacecraft (which can damage insulation, radiators and instrument optics), but also – if large enough – can penetrate parts of the spacecraft structure. Additionally, at the impact speed expected here, even minute specks of dust will be converted into an electrically charged plasma, which can lead to a current and might short out and damage some of the electronics. So the challenge we face is simple: how do we orient the spacecraft to maximise the science possibilities, best protect the most vulnerable and critical areas of the spacecraft body, respect the always-present pointing restrictions, maintain communication and minimise the possibility of any damage from hyper-velocity impacts? The answer, which we are developing now, will undoubtedly lie in trade-offs: to reduce risks and maximise science and survivability. We do know one thing for certain: there is no perfect answer! Great write up Daniel. An incredible important topic too. Notwithstanding the price tag of space missions, emotions and dreams of scientists and citizens around the globe are often shattered if a mission fails. So far only orientation as a passive method is discussed. Perhaps a pan-european, or international challenge seeking to develop a “general purpose” active-module, with a certain size and weight restriction may help? There are so many smart men and women out there, that sourcing their ideas and proposals are very valuable, even if they are not scientifically formulated, or physically tangible. They do inspire others. I think that the image you show from WISE is not the “good” Siding Spring. It seems to be a picture of C/2007 Q3 also called Siding Spring because it was discovered by this Australian observatory. This picture was made in 2010 (see : http://www.nasa.gov/mission_pages/WISE/multimedia/pia12830-a.html ). But the Siding Spring that will pass near Mars in october 2014 is 2013 A1 Siding Spring.